© Virk et al. ; Licensee Bentham Open. Irreparable rotator cuff (RC) tears without arthritis is a challenging clinical problem in young adults. Reverse total shoulder arthroplasty (RTSA) has been proposed as one of the surgical treatment options for this condition. In this review, we discuss the current understanding of the role of RTSA for the management of irreparable RC tears without arthritis based on authors personal experience and available scientific literature. Reverse total shoulder arthroplasty (RTSA) is a constrained arthroplasty system that can allow the deltoid and remaining rotator cuff to substitute for the lost function of irreparable RC. Furthermore, the pain relief is consistent with often a dramatic improvement in patient comfort, shoulder function and stability. 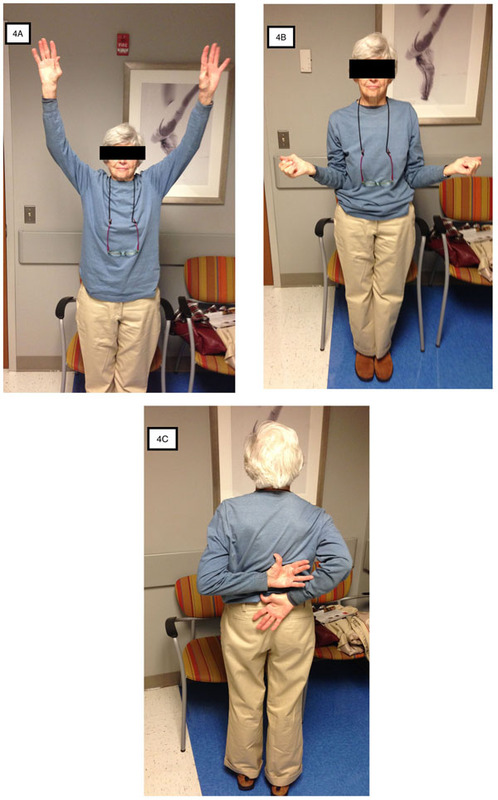 In patients with pseudoparalysis of the shoulder without advanced arthritis, RTSA effectively restores forward elevation above the shoulder but may not dramatically improve external (ER) or internal rotation (IR). However, due to concerns over implant longevity, caution has to be exercised when using RTSA for symptomatic irreparable RC tears with preserved active forward elevation (AFE) and in patients less than 65 years of age. RTSA is a reasonable surgical option for irreparable rotator cuff repair without arthritis. However, caution should be exercised when offering RTSA to young patients and patient without pseudoparalysis because they can have a higher complication and dissatisfaction rate. In addition, longevity of RTSA and subsequent need for revision surgery remains a significant concern in this population. Keywords: Irreparable rotator cuff tears without arthritis, pseudoparalysis of shoulder, reverse total shoulder arthroplasty, rotator cuff tears, shoulder arthritis. The definition of irreparable rotator cuff (RC) tear is inconsistent and used interchangeably with massive tears. However, massive rotator cuff tears do not necessarily equate with irreparability [1-5]. The determination of irreparability of RC tear can be a difficult decision to make at times preoperatively. Many times this decision is made intraoperatively after attempting to repair the torn tendon using modern techniques such as release of the capsule and adhesions, as well as anatomic orientation of the tendon on the humeral insertion. The characteristics of irreparability include advanced fatty infiltration of the RC muscles (Goutallier grade 3 or more), reduced acromiohumeral interval (AHI; less than 6 mm), loss of tendon length, and presence of poor quality tendon tissue [6-10]. The management of irreparable RC tears is challenging especially in patients less than 60 years old. In this review, we present our current understanding regarding the role reverse total shoulder arthroplasty (RTSA) in the management of irreparable RC tears without arthritis. Rotator cuff plays a critical role in glenohumeral motion and stability. The RC tendons create “concavity compression” that keeps the humeral head centered in the glenoid during range of motion (ROM) activities . Loss of RC function can lead to loss of concavity compression and can result in instability of the humeral head in superior, anterior or posterior direction. The RC function as force couples and provide a stable fulcrum for the deltoid muscle to effectively elevate the arm in all planes . In absence of functioning rotator cuff, active contraction of the deltoid may not result in effective elevation of the arm beyond 900 despite the presence of full passive forward elevation and is termed as “pseudoparalysis” of shoulder as shown in Fig. (1). Chronic large and massive RC tears over the period of time can result in series of pathologic changes in the glenohumeral articulation, [13-15]. This includes proximal migration of the humeral head with subsequent erosion and formation of a new articulation with the undersurface of the acromion (acetabularization of acromion). The humeral head gradually becomes rounded and osteopenic (femoralization) and is covered with atrophic cartilage. The glenoid cartilage is relatively preserved but may demonstrate preferential superior wear. The long head of the biceps also demonstrates pathology in form of instability in the bicipital groove, tendon hypertrophy, delamination and partial or complete tears. Other findings include leakage of synovial fluid through the tear into the subdeltoid bursa with associated bursal hypertrophy. In advanced stages, humeral head may demonstrate collapse and flattening with subsequent reduction of joint space and is termed “cuff tear arthropathy” . Interestingly, minimal osteophyte formation is seen. The etiology of cuff tear arthropathy, as well as its prevalence in the normal population is poorly understood. Crystal induced articular degeneration, nutritional factors and mechanical factors have been postulated in the etiology of cuff tear arthropathy [13, 15]. The progression of a chronic full thickness RC tear to the stage of cuff tear arthropathy is unpredictable and not all patients are overtly symptomatic during this progression . However, certain patients with chronic RC tears have significant functional limitations and pain without having advanced radiographic signs of cuff tear arthropathy as shown in Fig. (2). Pseudoparalysis of shoulder. Clinical photograph (front [B], back [A, C] and lateral [D] profile) of a patient with massive, irreparable left shoulder rotator cuff tear with pseudoparalysis and atrophy of supraspinatus and infraspinatus muscles (blue arrows in b). Preoperative imaging and postoperative radiographs of patient with symptomatic irreparable rotator cuff tear without glenohumeral arthritis. Preoperative radiographs (A-C) demonstrate preserved glenohumeral joint space (blue arrow) and proximal migration of the humeral head with reduced acromiohumeral interval (black arrow). Preoperative T2 weighted coronal (D) and T1 weighted sagittal (E) MRI images demonstrate rotator cuff tear with advanced fatty infiltration and atrophy of rotator cuff muscle (red arrow). Postoperative anteroposterior and axillary views (F and G) demonstrate a reverse total shoulder arthroplasty. The management of symptomatic, irreparable RC tear without arthropathy is challenging [5, 17]. The treatment of irreparable RC tear is influenced by multiple factors, which include severity of clinical symptoms (pain, loss of elevation), age of the patient, size of the tear, and the presence of glenohumeral arthritis, pseudoparalysis and instability (anterosuperior escape). Irreparable RC tears without arthropathy can present with persistent shoulder pain, functional shoulder deficits (pseudoparalysis, poor rotation control [horn blower sign, and external rotation lag sign]), and shoulder instability (anterosuperior escape) [5, 18, 19]. The management of irreparable RC tears includes both surgical and nonsurgical treatment options [5, 18, 19]. Typical nonsurgical treatment consists of anti-inflammatory medications, subacromial corticosteroid injections and physical therapy. Injections that include hyaluronic acid or platelet rich plasma have also been suggested but their value for this condition is unknown . Joint sparing procedures and prosthetic replacement are potential options for patients that fail conservative treatment. Joint sparing procedures include arthroscopic debridement with or without partial rotator cuff repair, biceps tenotomy (with or without tenodesis), and tendon transfers [21-24]. Recently, the concept of superior capsular reconstruction with tensor fascia lata grafting has been shown to provide significant pain relief with healing of the graft in more than 80% of patients [25, 26]. The long-term outcome of this novel idea is currently unknown, as well as the impact of substituting tensor fascia lata autograft for more commonly used human dermal allografts. Arthroplasty options for irreparable RC tears include hemiarthroplasty and RTSA [18, 27-30]. RTSA is an excellent treatment for RC tear arthropathy in elderly patients [27, 31-34]. Hemiarthroplasty is less commonly used since the advent of RTSA and may be considered as a salvage option for situations like failed RTSA, and in patients with poor glenoid bone stock that precludes a RTSA [35, 36]. Anatomic total shoulder replacement (TSA) relies on an intact RC for stability and function. In a RC deficient shoulder, anatomic TSA frequently fails to restore adequate abduction, forward elevation and stability because the deltoid functions as a deforming force in the absence of RC. Furthermore, shearing forces result in eccentric loading of the glenoid component (“rocking horse” phenomenon), which subsequently leads to accelerated polyethylene wear and failure of the glenoid component . Similarly, hemiarthroplasty in a RC deficient shoulder results in unpredictable functional results often with no significant improvement in active forward elevation (AFE) because RC deficiency is not addressed with this procedure [15, 37]. Hence, nonconstrained hemiarthroplasty for the treatment of cuff tear arthropathy was termed “limited goal prosthesis” by Charles Neer . A number of unsuccessful constrained shoulder arthroplasty systems were developed before Paul Grammont proposed the modern concept of an inverse or reverse total shoulder arthroplasty. RTSA is a constrained shoulder arthroplasty system that has been adopted successfully for use in a RC deficient shoulder due to characteristic mechanical design and secure fixation on the scapula [34, 38, 39]. In RTSA the glenohumeral articulation morphology is inverted from normal anatomy, which means that the humeral head (sphere) is replaced with a polyethylene cup and the glenoid is replaced by a sphere (glenosphere). In the traditional Grammont-style RTSA, the center of rotation (COR) is fixed and medialized on the face of the glenoid. This medialized center of rotation combined with lengthening the position of the humerus with respect to the scapula increases the deltoid abductor component. The combination of an inverse implant design with a medialized and distalized COR, and a large glenosphere, results in improved arm elevation and abduction. These beneficial effects in motion are a result of improved deltoid abductor component and tension, as well as limitation of shearing forces across the glenohumeral articulation [34, 38]. RTSA has led to a paradigm shift in the surgical treatment of RC deficient shoulders. The early experience of RTSA was predominantly for the indication of cuff tear arthropathy where there was a combination of RC deficiency and end-stage arthritis of the glenohumeral articulation. 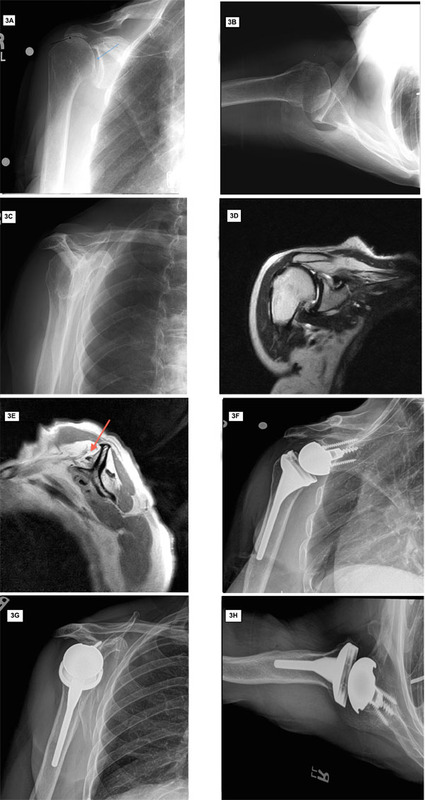 However, the complication rate compared to anatomic TSA was higher, and there were complications unique to RTSA design such as scapular notching, acromial stress fracture, and humeral loosening [40-42]. Furthermore, improvement in glenohumeral rotation continued to be a challenge, especially with a medialized center of rotation and absent function of the posterior RC including the teres minor. Continued innovation in the RTSA implant design including options for lateralization of the center of rotation, better fixation of the glenoid baseplate, as well as increased surgeon experience with RTSA has reduced some of these complications and improved outcomes, but longevity of the implant is still a concern to many [34, 41]. Preoperative imaging and postoperative radiographs of patient with symptomatic irreparable rotator cuff tear with pseudoparalysis. Preoperative radiographs (A-C) demonstrate preserved glenohumeral joint space (blue arrow) and proximal migration of the humeral head with reduced acromiohumeral interval (black arrow). Preoperative T2 weighted coronal (D) and T1 weighted sagittal (E) MRI images demonstrate rotator cuff tear with advanced fatty infiltration and atrophy of rotator cuff muscle (red arrow). Postoperative anteroposterior and axillary views (F-H) demonstrate a reverse total shoulder arthroplasty. 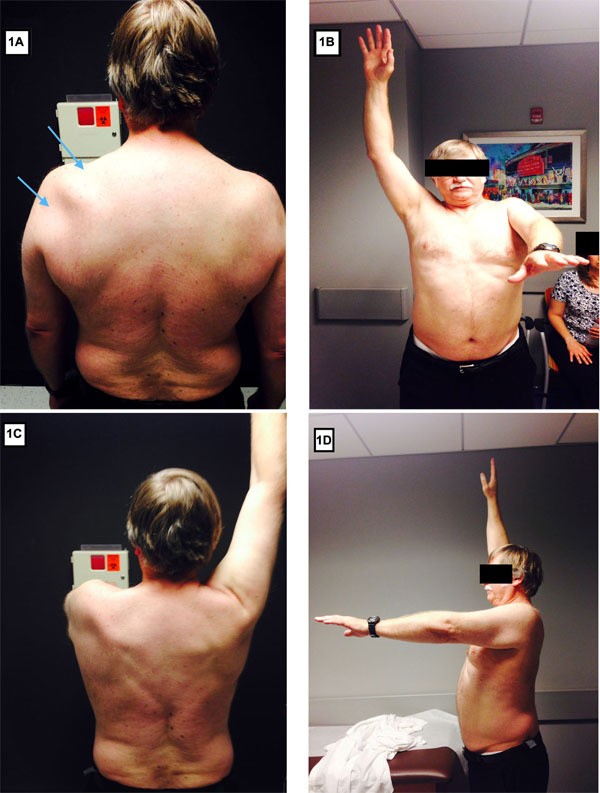 Restoration of forward elevation (A), external rotation (B) and internal rotation (C) after right reverse total shoulder arthroplasty for irreparable rotator cuff tear. The indications for RTSA have gradually expanded to include conditions other than cuff tear arthropathy such as treatment of failed RC repair or irreparable RC tears without arthritis, revision arthroplasty, and nonreconstructable proximal humerus fractures[19, 34, 43, 44]. Irreparable RC tears without arthritis is a unique situation where anatomic and functional loss of RC can result in limited active elevation with variable degrees of pain, the so-called pseudoparalytic shoulder as shown in Fig. (1A-D). There can also be persistent pain, and instability (proximal migration of humeral head and anterosuperior escape), all of which can lead to considerable disability. RTSA is indicated in patients with irreparable RC tears who have pseudoparalysis or instability or both [19, 27, 32, 34, 43]. When indicated, RTSA in a patient with irreparable RC tear provides stability, improved abduction, elevation, and reproducible pain relief as shown in Fig. (3) and Fig. (4) [27, 29, 32, 45]. However, caution is warranted when considering RTSA for a patient who has severe shoulder pain but good forward elevation. These subset of patients have higher dissatisfaction rates because of post-operative loss of active forward elevation [19, 27, 29]. Younger and active patients with irreparable RC tear who have failed all other treatment options are increasingly being considered for the option of RTSA. The complication rate after RTSA has been reduced with greater surgeon experience, better understanding of mechanics and improved designs of RTSA. However, the long-term outcome results from European surgeons provides the basis for concerns regarding the longevity of implant, increased demands on the prosthesis and its glenoid fixation, and lack of consistent salvage or revision procedure in a younger patient population. Long-term outcome studies with RTSA for cuff tear arthropathy demonstrate maintenance of good to excellent outcomes scores and less than 10% of patients proceeding to a revision arthroplasty [31-33, 46]. However, few studies have evaluated the outcomes and survivorship of RTSA for indication of irreparable RC tears without arthritis. In a retrospective review of 60 shoulders with RTSA for irreparable RC tears without arthritis, Mulieri et al. reported significant improvements in all the postoperative outcome scores (ASES American Shoulder and Elbow Society scores, SST Simple Shoulder Test and VAS Visual Analog Scale for pain) with a minimum follow up of 2 years . The average patient age was 71 years and overall implant survivorship was 90.7% at a mean follow up of 52 months. The mean AFE improved from 53 0 to 134 0 and abduction improved from 49 0 to 125 0. There were 12 complications (20% prevalence). Four patients in this cohort had preoperative elevation of >90 0 and subgroup analysis showed that this subgroup had higher complication rate compared to patients with preoperative pseudoparalysis (AFE<900). Wall et al. retrospectively reviewed the effect of etiologic diagnosis on the clinical and radiographic results of RTSA in a cohort of 186 patients (191 shoulders) . They compared five etiologic groups, which included RC tear arthropathy, massive RC tears without arthritis, primary osteoarthritis with RC tear, posttraumatic arthritis, and revision arthroplasty. Of note the mean age of the entire cohort was 72.7 years and mean follow up was approximately 40 months. Patient cohort with massive RC tears without arthritis had a mean follow up of 34 months and had comparable postoperative constant score, ROM and subjective rating of the outcome compared to subjects with cuff tear arthropathy. The mean AFE in the massive tear group without arthritis improved from average of 94 0 to 1430 and there was significant improvement in the postoperative constant scores. Patients in the posttraumatic arthritis and revision arthroplasty groups had worst postoperative outcome scores and less improvement in ROM compared to the remaining three groups. In a retrospective multicenter study, Boileau et al. reported on the outcomes of 42 RTSA in 40 patients with irreparable RC tears . The indication for RTSA was pseudoparalysis (30 shoulders) or a painful shoulder (12 shoulders). The mean age of the patients was 71 years and mean follow up was 50 months. Two patients (5%) underwent reoperation but none of the surgeries involved revision of glenoid or humeral components. There were 5 complications (12%), which included glenosphere disassembly, periprosthetic humeral shaft fracture, axillary granuloma and aseptic humeral loosening. Subgroup analysis demonstrated that patients in the painful shoulder group had postoperative loss of active anterior elevation (AAE, 146 0 to 122 0) and higher dissatisfaction rate (27%) compared to the patients in the pseudoparalysis group (AAE improvement from 56 0 to 123 0 and dissatisfaction rate of 7%). Werner et al. retrospectively reviewed 58 consecutive patients with irreparable RC tears who underwent RTSA for moderate to severe shoulder pain and pseudoparalysis . The mean age of the patients was 68 years and patients were examined at average follow up of 38 months. In this study, the cohort was a mixture of three groups of patients. The group A patients had no history of prior shoulder surgery, group B1 patients had a prior failed arthroplasty (TSA or hemiarthroplasty) and group B2 had a prior nonarthroplasty procedure (rotator cuff repair or debridement). The authors did not find significant difference in complication rates between three groups. The overall complication rate was 50% and the reoperation rate was 33% but only 6 patients required revision or removal of humeral or glenoid components. The aforementioned clinical outcomes studies demonstrate that RTSA is a good treatment option for pain relief and restoration of shoulder function in patients with irreparable RC tears without arthritis. Furthermore, the short and intermediate outcome results after RTSA in patients with irreparable RC tears with or without arthritis are not different. However, irreparable RC tears with preserved preoperative AFE are predisposed to a higher risk of loss of AFE and a higher dissatisfaction rate. The loss of motion is likely to be related to the design and biomechanics of reverse shoulder arthroplasty, which favors joint stability over mobility when compared to anatomic shoulder arthroplasty. Whether this subset of patients with preserved preoperative forward flexion have a lower implant survivorship and a higher complication rate is not entirely supported by available data in literature. In addition, prior history of nonconstrained arthroplasty (hemiarthroplasty or TSA) in presence of irreparable RC tear is a risk factor for poor outcome, lower AFE and higher complication rate after RTSA [19, 27]. Interestingly, the average age of the patients in the aforementioned studies was more than 65 years for all etiologies. We and others have shown that RTSA in patients with age less than 65 years has a higher complication rate but it provides a long lasting improvement in shoulder function, stability and pain relief [44, 48]. In younger patients with irreparable RC tears, one of the biggest frustrations is lack of active elevation and thus poor function. They may not have significant pain. Increasing experience with the use of RTSA and acceptance of irreparable RC tear as one of the indications for RTSA, it is tempting to offer RTSA to relatively younger patient. This is especially true when other alternative treatment options have failed or exhausted. There is no doubt that RTSA is the most predictable function restoring operation in this patient population, but due to younger age, absence of arthritis and presence of minimal pain it is a difficult decision to recommend arthroplasty. Furthermore, the challenge of higher complication rate, and revision surgery is a logical long-term concern in the younger patients. Salvage options after a failed RTSA remain limited and outcomes after revision RTSA are moderately good but associated with a high complication and reoperation rate [49, 50]. Prosthetic instability, humeral loosening and infection are three most common complications leading to revision of a RTSA [42, 49, 50]. Loss of active external rotation following RTSA can result in a high dissatisfaction rate because of lack of arm control in abduction. Gerber et al. reported their results with secondary latissimus dorsi transfer (LDT) for patients with loss of active external rotation after RTSA . Ten patients were treated with LDT at a mean of 27 months after RTSA. At a mean of 49 months after LDT, there was overall improvement in constant scores, subjective shoulder value, mean AFE and ER. Management of irreparable RC tear and poor shoulder function is a challenge. RTSA is a treatment consideration in patients with irreparable RC tears without arthritis who have failed other treatment options including nonoperative treatment and joint sparing procedures. The indications for RTSA in irreparable RC tears without arthritis include persistent pain, pseudoparalysis and shoulder instability. RTSA can provide substantial improvement in shoulder comfort, arm elevation, and shoulder function. However, patients with AFE greater than 140 degrees may actually loose motion after surgery. Caution should be exercised when offering RTSA to young patients with irreparable RC tears because they can have a higher complication and dissatisfaction rate. In addition, longevity of RTSA and subsequent need for revision surgery remains a significant concern in this population. Lädermann A, Denard PJ, Collin P. Massive rotator cuff tears: definition and treatment. Int Orthop 2015; 39(12): 2403-14. Rokito AS, Cuomo F, Gallagher MA, Zuckerman JD. Long-term functional outcome of repair of large and massive chronic tears of the rotator cuff. J Bone Joint Surg Am 1999; 81(7): 991-7. Neri BR, Chan KW, Kwon YW. Management of massive and irreparable rotator cuff tears. J Shoulder Elbow Surg 2009; 18(4): 808-18. Goutallier D, Postel JM, Gleyze P, Leguilloux P, Van Driessche S. Influence of cuff muscle fatty degeneration on anatomic and functional outcomes after simple suture of full-thickness tears. J Shoulder Elbow Surg 2003; 12: 550-4. Matsen FA III, Chebli C, Lippitt S. Principles for the evaluation and management of shoulder instability. J Bone Joint Surg Am 2006; 88(3): 648-59. Lugo R, Kung P, Ma CB. Shoulder biomechanics. Eur J Radiol 2008; 68(1): 16-24. Neer CS II, Craig EV, Fukuda H. Cuff-tear arthropathy. J Bone Joint Surg Am 1983; 65(9): 1232-44. Visotsky JL, Basamania C, Seebauer L, Rockwood CA, Jensen KL. Cuff tear arthropathy: pathogenesis, classification, and algorithm for treatment. J Bone Joint Surg Am 2004; 86-A(Suppl. 2): 35-40. Dines DM, Moynihan DP, Dines JS, McCann P. Irreparable rotator cuff tears: what to do and when to do it; the surgeon’s dilemma. Instr Course Lect 2007; 56: 13-22. Gerber C, Wirth SH, Farshad M. Treatment options for massive rotator cuff tears. J Shoulder Elbow Surg 2011; 20: S20-9. Harreld KL, Puskas BL, Frankle MA. Massive rotator cuff tears without arthropathy: when to consider reverse shoulder arthroplasty. Instr Course Lect 2012; 61: 143-56. Gross C, Dhawan A, Harwood D, Gochanour E, Romeo A. Glenohumeral joint injections: a review. Sports Health 2013; 5(2): 153-9. Gartsman GM. Massive, irreparable tears of the rotator cuff. Results of operative debridement and subacromial decompression. J Bone Joint Surg Am 1997; 79(5): 715-21. Walch G, Edwards TB, Boulahia A, Nove-Josserand L, Neyton L, Szabo I. Arthroscopic tenotomy of the long head of the biceps in the treatment of rotator cuff tears: clinical and radiographic results of 307 cases. J Shoulder Elbow Surg 2005; 14: 238-46. Mihata T, Lee TQ, Watanabe C, et al. Clinical results of arthroscopic superior capsule reconstruction for irreparable rotator cuff tears. Arthroscopy 2013; 29: 459-70. Mihata T, McGarry MH, Pirolo JM, Kinoshita M, Lee TQ. Superior capsule reconstruction to restore superior stability in irreparable rotator cuff tears: a biomechanical cadaveric study. Am J Sports Med 2012; 40(10): 2248-55. Boileau P, Gonzalez JF, Chuinard C, Bicknell R, Walch G. Reverse total shoulder arthroplasty after failed rotator cuff surgery. J Shoulder Elbow Surg 2009; 29: 459-70. Goldberg SS, Bell JE, Kim HJ, Bak SF, Levine WN, Bigliani LU. Hemiarthroplasty for the rotator cuff-deficient shoulder. J Bone Joint Surg Am 2008; 90(3): 554-9. Mulieri P, Dunning P, Klein S, Pupello D, Frankle M. Reverse shoulder arthroplasty for the treatment of irreparable rotator cuff tear without glenohumeral arthritis. J Bone Joint Surg Am 2010; 92(15): 2544-56. Ramirez MA, Ramirez J, Murthi AM. Reverse total shoulder arthroplasty for irreparable rotator cuff tears and cuff tear arthropathy. Clin Sports Med 2012; 31(4): 749-59. Cuff D, Clark R, Pupello D, Frankle M. Reverse shoulder arthroplasty for the treatment of rotator cuff deficiency: a concise follow-up, at a minimum of five years, of a previous report. J Bone Joint Surg Am 2012; 94(21): 1996-2000. Ek ET, Neukom L, Catanzaro S, Gerber C. Reverse total shoulder arthroplasty for massive irreparable rotator cuff tears in patients younger than 65 years old: results after five to fifteen years. J Shoulder Elbow Surg 2013; 22: 1199-208. Matsen FA III, Boileau P, Walch G, Gerber C, Bicknell RT. The reverse total shoulder arthroplasty. J Bone Joint Surg Am 2007; 89(3): 660-7. Gamradt SC, Gelber J, Zhang AL. Shoulder function and pain level after revision of failed reverse shoulder replacement to hemiarthroplasty. Int J Shoulder Surg 2012; 6(2): 29-35. Wiater JM, Fabing MH. Shoulder arthroplasty: prosthetic options and indications. J Am Acad Orthop Surg 2009; 17(7): 415-25. Sanchez-Sotelo J, Cofield RH, Rowland CM. Shoulder hemiarthroplasty for glenohumeral arthritis associated with severe rotator cuff deficiency. J Bone Joint Surg Am 2001; 83-A(12): 1814-22. Boileau P, Watkinson DJ, Hatzidakis AM, Balg F. Grammont reverse prosthesis: design, rationale, and biomechanics. J Shoulder Elbow Surg 2005; 14: 147S-61S. Baulot E, Sirveaux F, Boileau P. Grammont’s idea: The story of Paul Grammont’s functional surgery concept and the development of the reverse principle. Clin Orthop Relat Res 2011; 469(9): 2425-31. Cheung E, Willis M, Walker M, Clark R, Frankle MA. Complications in reverse total shoulder arthroplasty. J Am Acad Orthop Surg 2011; 19(7): 439-49. Scarlat MM. 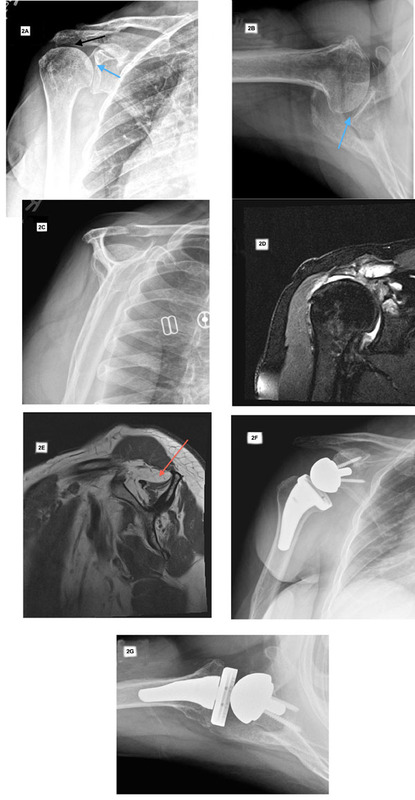 Complications with reverse total shoulder arthroplasty and recent evolutions. Int Orthop 2013; 37(5): 843-51. Zumstein MA, Pinedo M, Old J, Boileau P. Problems, complications, reoperations, and revisions in reverse total shoulder arthroplasty: a systematic review. J Shoulder Elbow Surg 2011; 20: 146-57. Drake GN, O’Connor DP, Edwards TB. Indications for reverse total shoulder arthroplasty in rotator cuff disease. Clin Orthop Relat Res 2010; 468(6): 1526-33. Sershon RA, Van Thiel GS, Lin EC, et al. Clinical outcomes of reverse total shoulder arthroplasty in patients aged younger than 60 years. J Shoulder Elbow Surg 2014; 23: 395-400. Favard L, Levigne C, Nerot C, Gerber C, De Wilde L, Mole D. Reverse prostheses in arthropathies with cuff tear: are survivorship and function maintained over time? Clin Orthop Relat Res 2011; 469(9): 2469-75. Wall B, Nové-Josserand L, O’Connor DP, Edwards TB, Walch G. Reverse total shoulder arthroplasty: a review of results according to etiology. J Bone Joint Surg Am 2007; 89(7): 1476-85. Muh SJ, Streit JJ, Wanner JP, et al. Early follow-up of reverse total shoulder arthroplasty in patients sixty years of age or younger. J Bone Joint Surg Am 2013; 95(20): 1877-83. Black EM, Roberts SM, Siegel E, Yannopoulos P, Higgins LD, Warner JJ. Failure after reverse total shoulder arthroplasty: what is the success of component revision? J Shoulder Elbow Surg 2015; 24(12): 1908-4. Boileau P, Melis B, Duperron D, Moineau G, Rumian AP, Han Y. Revision surgery of reverse shoulder arthroplasty. J Shoulder Elbow Surg 2013; 22: 1359-70. Puskas GJ, Germann M, Catanzaro S, Gerber C. Secondary latissimus dorsi transfer after failed reverse total shoulder arthroplasty. J Shoulder Elbow Surg 2015; 24(12): e337-44.